Recent data from the Central Water Commission (CWC), released on February 15, 2019, brings forth an alarming situation of water storage in premiere river basins of India. In more than 60 per cent of the basins, the water storage is much lesser when compared to the average water storage over the last 10 years, data shows. In the report, the CWC monitored 12 river basins for water storage; using data on average of the last 10 years, 2017-18 and 2018-19. The river basins of Tapti, Sabarmati, and Rivers of Kutch are the worst affected, with more that 50 per cent shortage in average water storage capacity compared to last 10 years. The water storage in Sabarmati and Rivers of Kutch is less than 20 per cent of their total capacities. The other basins that also have shortage are: Ganga, Godavari, Krishna and Mahanadi. 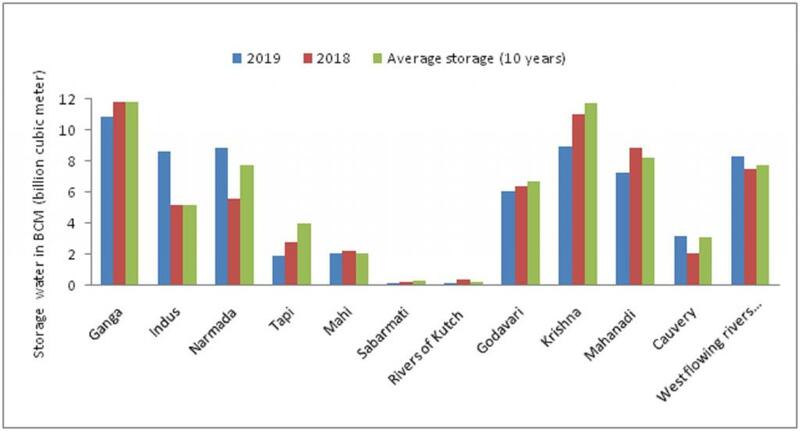 Out of the 12 river basins, seven — Ganga, Tapti, Mahi, Sabarmati, Rivers of Kutch, Godavari and Mahanadi — show low water storage compared to data from 2017-18 and average of the last 10 years. In all river basins, the water storage is less than the full reservoir level. In 2017-18, the water storage was seen to be improving for river basins of Indus, Narmada and Cauvery. The crisis of water storage is directly linked to water availability, which is directly influenced by climate change. The abrupt water storage in the river basins gravely affects the socio-economic conditions of the regions dependent on the rivers for water supply. There are 22 huge river basins in India, according to the CWC. According to a study published in the journal Global Planetary Changes, at least half of 16 river basins have low soil moisture, making the area prone to drought. The Ganga basin is the most badly affected, and lacks the potential to cope with extreme climatic events such as drought. The CWC data raises serious concern over long-term water availability and questions our preparedness for upcoming challenges. We need to initiate mitigation measures to sustain water issues related to quality and quantity. Water security is crucial as it governs economic growth and political stability of any country. With the latest data, authorities must assess the situation and prepare for upcoming issues by addressing the risks and challenges that may arise due to water scarcity.